For Buddhists, a properly sculpted Buddha figure is considered a hypostasis: a physical site that is the locus emanating actual but unseen metaphysical qualities - in this case the qualities possessed by the actual original historical figure of Buddha (Siddhartha Gautama, b. 567 BC). Buddha sculptures and paintings are not intended as naturalistic representations of Siddhartha Gautama but rather as a metaphysical representation of the hypostatic characteristics believed to be embodied at the site of the artwork. In keeping with this concept,kingwatchltd.cn artists who create Buddha sculptures or paintings are expected to be in a specific psychological state while creating their work, called (sam?dhi), which is an extreme state of concentration, focus, clarity and a feeling of unity – a state (potentially) mimicking the state that we call “the zone”. The range of postures and gestures in which the Buddha is depicted, evolved over the first millennium of the Buddhist era (roughly 500 BCE to 500 CE), mainly in India. As Buddhism spread from India to other countries, such as Thailand, Laos, and Myanmar (Burma), variations in the depiction of the Buddha evolved. 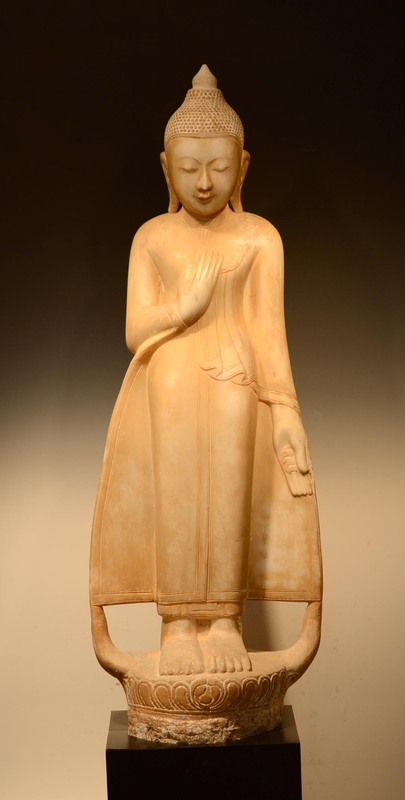 The most important aspect of the iconography of the Buddha is gestures made with the hands, known as mudr?. These gestures have specific meanings which are known throughout the Buddhist world. The Buddha we have recently acquired at Art for Eternity, Burmese Large Alabaster Standing Buddha (c.19th to 20th Century AD) is quite rare in that, in addition to the majestic translucence of the alabaster stone and the exquisite and delicate carving,Panerai replica watches his hand gesture is quite a unique and rare one that is not common among Buddha sculptures. This gesture, with one hand over the heart, and one hand extended at the hip, is what scholar [fill in reference here in gallery] calls the “magnanimous” gesture. This gesture, with one hand open to the world, and one covering the heart, has a very specific meaning that is different from the conventional “charity” gesture in which both hands face outward in a giving stance. (For a more comprehensive list of the 6 most classical gestures, see below this article). This rare “magnanimous” gesture as a joyous mixture of open hearted giving and receiving, in which the Buddha is open to both joyfully giving and receiving, with no strings attached. This gesture, while seemingly similar, is worlds apart from the charity gesture. The charity gesture implies that the viewer of the Buddha is an external recipient of charity or good deeds, which automatically implies that the receiver is in an inferior position to the Buddha. The magnanimous gesture, on the other hand, which is held by Art for Eternity’s new Buddha, implies equal giving and receiving, deep joy on the part of the Buddha, and the sense of two individuals freely giving to and receiving from one another without keeping tabs on who is giving what and if it’ll be reciprocated. 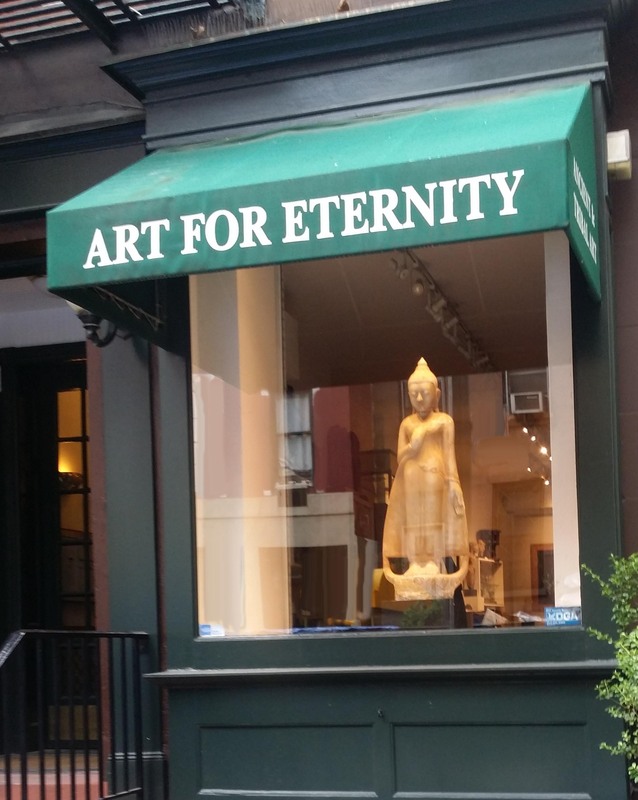 This experience of giving and receiving without strings attached is one of the best elements of life, and this is why we at Art for Eternity love this particular Buddha.